Sensor Includes a 4-Wire M12 Connector Plug for Attachment to Process Instrumentation. An M12 Extension Cable is Required for Installation. Available with A Variety of Immersion Lengths. Note: These Sensors Require an M12 Extension Cable to Connect the Sensor To Your Instrumentation. A Partial List Of Our M12 Extension Cables is Included in the Ordering Table Below. This Pt100 RTD sensor is designed for use in sanitary or Clean-In-Place (CIP) applications where the use of a thermowell assembly is preferred over direct immersion sensors. The thermowell includes a 1½", 16AMP cap feature for easy installation using industry standard gaskets and clamps. 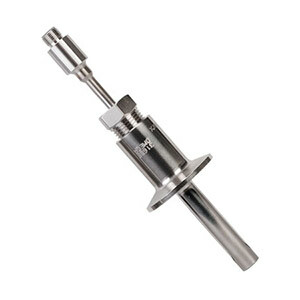 The spring loaded RTD probe can be removed from the thermowell without exposing the system to ambient conditions for calibration or replacement. This sensor includes a 4-Pin, M12 Connector for easy installation using an extension cable. 316L stainless steel process wetted surfaces with surface finishes of 32 microinches or better. Immersion lengths of 15⁄8, 2½", 4½", 7½, and 10½" are available from stock, with others available. Sensor Output is a 4-wire, 100 ohm, Class A, Platinum RTD meeting the requirements of IEC 60751. These sensors can be used with 2-wire or 3-wire systems see information below. Insulation resistance values of 100 megohms minimum at 100 VDC. These sensors are supplied standard as 4-wire assemblies with 4-pin connectors. When used in 3-wire applications, use pins A, B and C as shown in the wiring detail below. When used in 2-wire systems, connect one wire to pins A or B, and the other wire to pins C or D as shown below. 참고: For other cap sizes or styles, other immersion lengths, or for thermistor versions of this product, please contact Sales.